From intracellular surgery to vision correction, ultrashort-pulse lasers play a critical behind-the-scenes role for today’s clinicians. 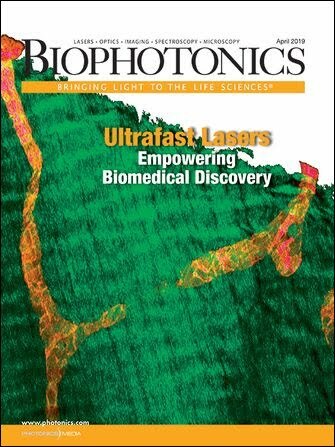 From nonsurgical vision correction to multiphoton imaging to neuronal optogenetics, ultrashort-pulse lasers — also informally known as ultrafast lasers — have become essential tools in biomedical discovery. VEGFR3-positive (red) lymphatic vessels in diaphragm whole-mount section. Collagen fibers were visualized by second-harmonic generation (SHG) (green). Scale bar = 100 µm. Courtesy of Friedemann Kiefer, European Institute for Molecular Imaging. The technology that lead to the development of these lasers reached a breakthrough in the mid-1980s when Gérard Mourou and Donna Strickland, who won the 2018 Nobel Prize in physics (alongside Arthur Ashkin), developed chirped-pulse light amplification. Upgrades in terms of footprint, efficiency, and reliability over the last three decades have allowed biologists to use ultrafast lasers without having to become experts in the technology. Henry Kapteyn and Margaret Murnane, now at the University of Colorado Boulder, were among the earliest to realize the potential for titanium:sapphire (Ti:sapphire) ultrafast lasers. Peter Moulton, of the Massachusetts Institute of Technology’s (MIT’s) Lincoln Lab, developed the titanium-doped sapphire crystals, and Kapteyn applied the material for femtosecond devices in Roger Falcone’s lab at the University of California, Berkeley in 1990. In 1994, Kapteyn and Murnane founded KMLabs to meet the demand for their femtosecond laser design. The company now builds Ti:sapphire and ytterbium fiber ultrashort-pulse lasers that are essentially tabletop x-ray and extreme-UV sources that can be used for biological investigation (Figure 1). Figure 1. A section from a z-stack of a larval zebra fish brain (GcAMP) was produced using 1330 nm at 1 MHz with KMLabs’ ytterbium fiber optical parametric amplifier. Young zebra fish are very susceptible to heat-induced damage, and the low repetition rate prevented damage caused by high average power. Courtesy of Cornell University. Because Kapteyn and Murnane are academic researchers as well as source manufacturers, their work often crosses boundaries. One recent example involves KMLabs’ x-ray microscope, which uses the electromagnetic radiation generated from a tabletop ultrafast laser source. The microscope does not require delicate sample preparation as in cryoelectron microscopy and promises both high contrast and nanometer-scale spatial resolution. Kapteyn sees further uses of femtosecond lasers in intracellular surgery where, he says, “It’s possible to excise functions within a cell,” as well as for nonsurgical methods for correcting vision. Sinisa Vukelic is a lecturer of mechanical engineering at New York City’s Columbia University. In May 2018, his group published the results of a technique for vision correction using a femtosecond laser that pushes light- matter interaction in a novel direction1. Figure 2. Columbia University’s Sinisa Vukelic deployed a pulse from a femtosecond oscillator to strengthen corneal proteins. Corneal topography before (top) and after treatment (bottom), paired with virtual vision that simulates the effects of induced refractive power change. Courtesy of Sinisa Vukelic, Columbia University. Vukelic and colleagues have deployed a femtosecond pulse to strengthen eye tissue (Figure 2). The pulse induced low-density plasma formation in the cornea, and the plasma in turn provoked the evolution of reactive oxygen species that cross-linked corneal proteins. The cross-linked proteins altered the physical shape of the tissue and corrected subjects’ vision. With nearly 60 percent of the adult population in the U.S. alone requiring some form of vision correction, such as eyeglasses or contact lenses, Vukelic’s technique provides a promising alternative to the more invasive LASIK procedure for vision correction, which has been decreasing in use in the U.S. He hopes to begin clinical trials this year. In collaboration with Gerard Ateshian’s Musculoskeletal Biomechanics Lab at Columbia, Vukelic is also testing the technique to cross-link collagen fibers to combat degenerative diseases such as osteoarthritis (OA) earlier. OA is the most common form of arthritis, affecting about 3 percent of the global population — more than 230 million people — and results when cartilage and the underlying bone break down. Arrigoni sees ultrashort-pulse ytterbium fiber lasers and amplifiers making inroads into the Ti:sapphire laser market and replacing them for some applications. In the last five years, ytterbium fiber devices have emerged as strong competitors in the biomedical market, as technical challenges, including unintended nonlinear effects, have been overcome. “Because [ytterbium fiber lasers] can operate at much higher repetition rates, researchers can acquire data more rapidly,” he said. The trade-off is in pulse duration, where fiber devices typically produce pulses in the hundreds of femtoseconds — or nearly 10× longer than Ti:sapphire lasers. Nonlinear and multiphoton microscopy are areas in which ytterbium fiber lasers have started to replace Ti:sapphire. Fiber lasers and amplifiers generate femtosecond pulses that are amplified in multiple successive fiber stages, while Ti:sapphire amplifiers generate pulses off a static, sapphire crystal doped with titanium ions. In both types of devices, prior to the amplification process, the pulses must be temporally stretched to hundreds of picoseconds to avoid peak-power-related damage in the optical elements of the amplifier. They are then recompressed to deliver the shorter femtosecond pulse. This is the technique for which Mourou and Strickland received the Nobel Prize — chirped-pulse amplification. Friedemann Kiefer, a professor of intravital molecular imaging at the European Institute for Molecular Imaging in Münster, Germany, concurred, noting that “ultrafast lasers are the heart of any multiphoton microscopy system”. Kiefer credits a substantial increase in output power and the development of integrated and automated laser systems with allowing researchers such as himself to add the devices to their toolboxes — despite that he is a trained biochemist who was initially inexperienced with laser technologies. “Life science researchers want a turnkey system where they don’t have to think about laser performance at all,” he said. Kiefer has transitioned his group from older, less reliable Ti:sapphire devices to a fiber laser setup, noting that fiber lasers are the light sources of the future for multiphoton microscopy. Kiefer’s lab and colleagues have used multiphoton imaging to study the developing lymphatic system in a living animal model. Also, using light-sheet imaging, they created a new method to produce 3D histopathological images of lymphatic malformations, which they termed VIPAR (volume information-based histopathological analysis by 3D reconstruction and data extraction)2. And in October 2018 they found that fluorescent imaging of matrix metalloproteinase enzymes could reveal stable versus unstable atherosclerotic plaques in a mouse model of atherosclerosis3. Atherosclerotic plaque ruptures often lead to strokes, and earlier unstable plaque detection may aid preventative interventions. According to Kiefer, scientists are moving away from two-photon and into three-photon microscopy. Recent results from Chris Xu’s lab at Cornell University demonstrate that three-photon imaging can be used to visualize vasculature and neurons — through intact skull — in living mice4. Xu helped develop the three-photon technique as a graduate student at Cornell. Optogenetics, a method that uses light to stimulate cells (usually neurons) in living tissue, is another area where ultrafast lasers have played a key role. Physicist Valentina Emiliani, of the French National Centre for Scientific Research, collaborated with MIT neurotechnology professor Edward Boyden, who helped develop optogenetics, on a method to control individual neurons in intact mouse brain circuits using computer-generated holography and temporal focusing5. “Combined with targeted opsins, holographic multiphoton excitation enables precise manipulation of neuronal circuits, which would be impossible with conventional optical or electrophysiological approaches,” she said. The author would like to thank Henry Kapteyn and Scott Domingue, KMLabs; Sinisa Vukelic, Columbia University; Marco Arrigoni, Coherent Inc.; Friedemann Kiefer, the European Institute for Molecular Imaging; and Valentina Emiliani, the French National Centre for Scientific Research. 1. C. Wang et al. (2018). Femtosecond laser crosslinking of the cornea for non-invasive vision correction. Nat Photonics, Vol. 12, pp. 416-422. 2. R. Hägerling et al. (2017). VIPAR, a quantitative approach to 3D histopathology applied to lymphatic malformations. JCI Insight, Vol. 2, Issue 16: e93424. 3. R. Seifert et al. (2018). Molecular imaging of MMP activity discriminates unstable from stable plaque phenotypes in shear-stress induced murine atherosclerosis. PLoS ONE, Vol. 13, Issue 10: e0204305. 4. T. Wang et al. (2018). Three-photon imaging of mouse brain structure and function through the intact skull. Nat Methods, Vol. 15, Issue 10, pp. 789-792. 5. O. Shemesh et al. (2017). Temporally precise single-cell-resolution optogenetics. Nat Neurosci, Vol. 20, pp. 1796-1806.